We rather enjoyed Space Invaders Extreme on the Xbox Live Arcade, especially the four player cooperative mode. It's oddly satisfying blasting those 8-bit baddies into pixelated pieces to the thumping soundtrack of techno. We've just gotten word that a brand new pack of content is set to hit the Xbox Live Marketplace today, and with it comes more co-op action. There will be three new stages, new enemies, and new bosses. Additionally, the expansion pack will contain two emulators of the original black-and-white Space Invaders and 8-bit color Space Invaders 2! Kind of a bummer we need to pay for the classic games, but at least you can get them now. 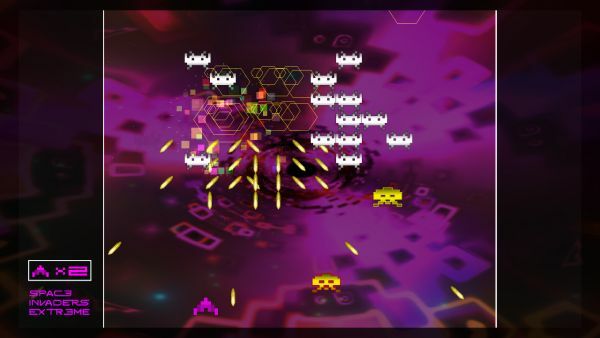 New Space Invaders Extreme Screens and Trailer are...Extreme! Page created in 0.2619 seconds.